Is Chinese Alibaba Group Going to Aquire Alibabacoin (ABBC)? Alibabacoin Foundation and China’s Alibaba Holding Group is having a dispute over trademark licences in the Manhattan court of the United States of America. Alibabacoin Foundation CEO, Jason Daniel Paul Phillip stated that Alibabacoin Foundation offered a settlement to Alibaba Group Holdings a month ago. In response while looking at the ongoing settlement negotiation, Alibaba Group stated that they are excited to acquire the Dubai-based startup. Alibaba Group China has the largest online shopping mall in the world and is a global company listed on the US stock market. While on the other hand, Alibabacoin Foundation is a startup blockchain company that has developed Alibabacoin (ABBC) and MC wallet, preparing to provide full services to their users. The two companies are currently engaged in a lawsuit in the Manhattan court. However, Alibabacoin Foundation has won the preliminary injunction requested by the Alibaba Group China in April this year. Alibaba Group China holds the most blockchain technology license in the world. Recently, Jack Ma, ex-executive chairman of Alibaba Group has passed on his title to their ex-CEO to be the next executive chairman for the group. It seems that Alibaba Group is seeking for a new opportunity to run the business in different field and it seems like the lawsuit between the two company is because the Alibaba Group wants to aquire Alibabacoin. 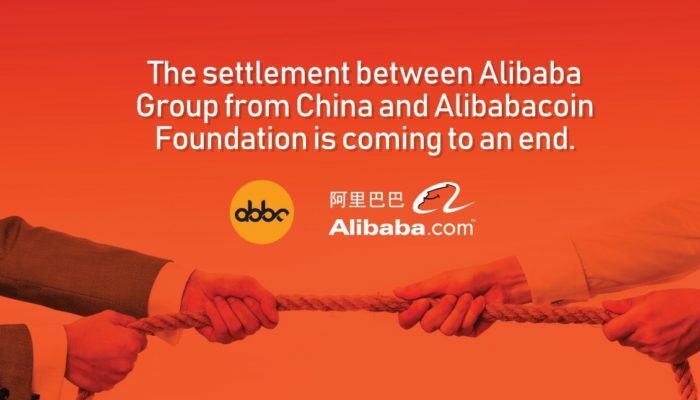 In the disadvantaged Alibaba Group in the lawsuit perspective, it is likely to come up with a final settlement regarding Alibabacoin Foundation’s offer for acquiring the company. Alibabacoin (ABBC) is currently listed in 10 different exchanges, Coinsuper, Coinbene, Ooobtc, Dragonex, Idax, Topbtc, Rightbtc Sistemkoin, Bitforex, Bit-z and everyday the price is rapidly going up. They provide blockchain technology and coin wallet service to their users and recently announced their business plan that the company will be launching a largest online shopping mall where people can pay with cryptocurrency. The rapid increase in price shows that people needs to keep an eye on Alibabacoin (ABBC).